This initiative was inspired by the millions of individuals affected by epilepsy, one of the most common serious brain disorders in the USA and worldwide. Seizures can strike suddenly and unexpectedly at any point in one’s life and it is estimated that 1 in 26 individuals will be diagnosed with epilepsy during their lifetime. Men, women and children of all races, cultures and income levels have epilepsy. Epilepsy affects about 350,000 families in California, about 2 million families in the USA, and about 65 million families around the world. In fact, according to the World Health Organization, epilepsy is the most common, serious neurological disorder in the world, but it remains the most under-funded and the least understood and, hence, the most stigmatized. Seizures steal moments and memories and can change lives, impact development, affect learning and even result in early death. There are no known cures. Everyone can see when an athlete breaks his leg. Everyone can see when a child gets a scar from a fall or accident. But not everyone can tell when someone has suffered brain trauma. Many times, people are apt to shake off brain trauma as no big deal and get right back to work or back in the game. More often than not, this comes from public encouragement that 'you'll be alright' or 'be tough and get back in there'. It takes a little more time and effort to recognize when someone may be suffering from a concussion or brain illness. Everyone has a brain. Seizures come from the brain. So everyone needs to know how to care for the brain. Caring for the brain can help to: (1) Prevent brain trauma and seizures, and (2) Reduce seizures if you have epilepsy. Read below for some important ways to care for the brain. Anyone can have a seizure at any time, so everyone needs to know how about Epilepsy and Seizure First Aid. Read below for simple and detailed instructions on Seizure First Aid. How Kids and Adults can "Love Your Brain Now"
Good health starts with your brain so don’t take it for granted. Your brain is one of the most important body organs. Your brain needs care. Eat a good diet. Eat a low-fat, low cholesterol diet that features vegetables and fruits, foods rich in antioxidants, vitamins, folate and Omega-3 fatty acids. It’s good for the brain. Physical exercise keeps the blood flowing and encourages new brain cells. Keep both body and brain active. Get proper sleep. Sleep is very important to restore the brain. Take precautions against injuries. Use your car seat belts, unclutter your house to avoid falls, and wear a helmet when cycling to protect your head and brain. 6 - Use Your Head. Use your Brain. Prevent heart disease, high blood pressure, diabetes and stroke. Keep your body weight, blood pressure, cholesterol, and blood sugar levels within recommended ranges. Enjoy activities that combine physical, mental and social elements. Play, be social, converse and volunteer. Keeping your brain active and engaged increases it vitality and builds reserves of brain cells and connections. Read, write, play games, do crossword puzzles. 4.) Make sure they are Safe. Stay calm and keep track of time. Loosen tight clothing, like tie or collar. Cushion head to protect from injury. Call 911, if multiple seizures or seizure lasts more than 5 minutes. X Do NOT hold down or restrain the person. X Do NOT put anything in person’s mouth. 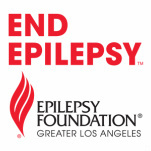 Established in 1957 as a 501(c)3 charitable organization, the Epilepsy Foundation of Greater Los Angeles is leading the fight to END EPILEPSY® and the burden of seizures. Our fundraising and community efforts support care, advocacy and education, today, while investing in research and hope for tomorrow. Visit us online at ENDEPILEPSY.org.